Adenoid cystic carcinoma (ACC) of the head and neck is a rare and highly malignant tumor, characterized by perineural growth and early distant metastases. The composition of immune cells in the peripheral blood and the tumor microenvironment is critical to tumor growth and control. However, little is known about the frequency and function of the relevant immune cell subsets in this entity. In ACC patients (n = 11) and matched healthy donors (n = 11), the frequency of peripheral blood T and B cells was measured by flow cytometry at different treatment stages of disease (24 samples). Cells were further characterized by their expression of CCR7, PD-1, CD39 and CD73. Tumor-infiltrating lymphocytes (TIL) were analyzed by immunohistochemistry for ten patients and for three patients by flow cytometry. CD4+ T cells had significantly lower frequency after radiotherapy (RT). All other cell frequencies, including Treg, were stable through course of the disease. In B cells, CD73 was reduced after RT. CCR7 expression on T and B cells in patients with relapse/metastases (R/M) differed significantly from patients with active disease. PD-1 remained stable. Treg were more present in TIL compared to peripheral blood. 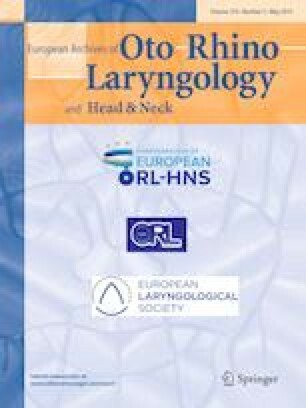 Composition of lymphocyte subgroups behaves similar to squamous cell carcinoma in the head and neck, except for Treg, which remained stable. Nevertheless, the CD4+/Treg ratio was lower after RT, which could stand for an immunosuppressive effect in these patients. Therefore, it could be beneficial treating ACC with combined RT and immunomodulatory drugs. The online version of this article ( https://doi.org/10.1007/s00405-019-05363-2) contains supplementary material, which is available to authorized users. We thank Katja Hasch, Gabriela Cudek and Monika Jerg for their support in performing the experiments. SSJ, UH and SEW performed experiments; SSJ and SEW prepared figures; JV and JD provided patient samples; SSJ, PJS and JD designed research and wrote the paper; MNT, CB, and TKH edited the paper. This study was funded by German Research Foundation (DFG) Grant # SCHU 2536/3 and the International Graduate School in Molecular Medicine Ulm. There are no potential conflicts of interest to disclose. The research was supported by the German Research Foundation (DFG) Grant # SCHU 2536/3 (PJS) and by the International Graduate School in Molecular Medicine Ulm (SSJ). This article does not contain any studies with animals performed by any of the authors. All procedures performed in studies involving human participants were in accordance with the ethical standards approved by the local ethical committee (#255/14).